A magnificent arts and crafts oak double bed; featuring a classic slatted and carved design to headboard and matching footboard, this bed is in outstanding condition for its age. 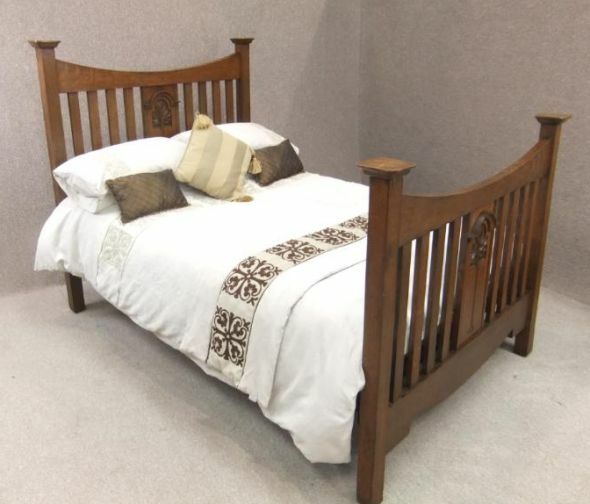 As you can see by the large selection of photographs, this arts and crafts oak double bed is substantially made with 2.5" square columns to all four corners, and large oak square caps. The headboard and footboard are held together with robust side irons, and the bed is supplied with a newly made pine bed base. This is probably one of the best arts and crafts beds that we have had in stock for a long time, and worth coming to have a look at.